Vertical Sleeve Gastrectomy (VSG) has recently been recognized as a potential stand alone operation for the treatment of obesity. Given the improvements in surgical techniques and medical management, we performed, to our knowledge, the first VSG on an out patient basis. We will report our first 40 VSG patients done in an ambulatory surgical setting. Patient selection, instruction, pre and post operative medications, recovery protocol, follow up protocol, and complication experience will be discussed. 1. 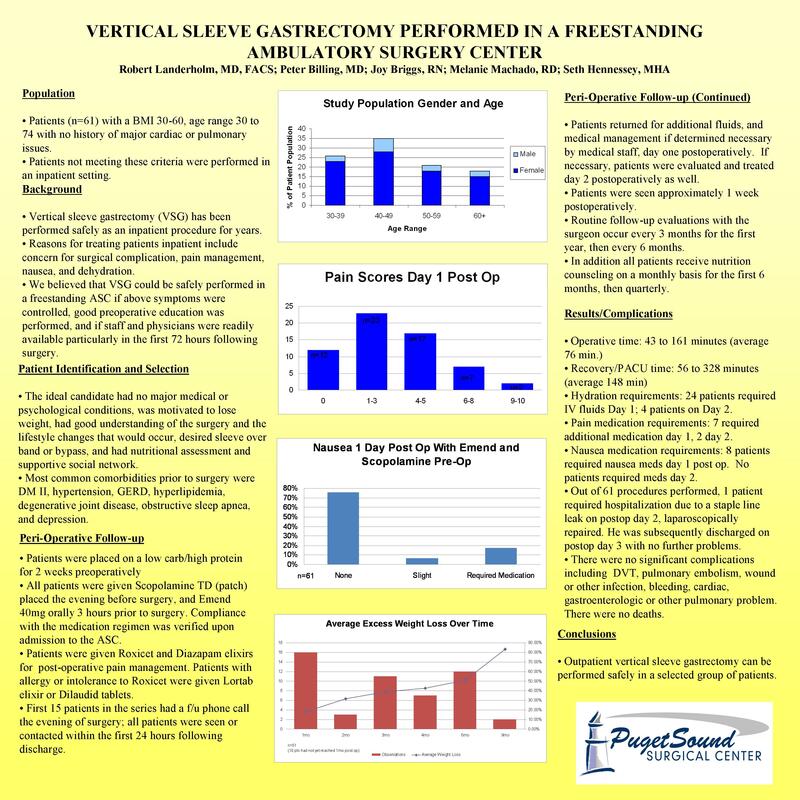 OBJECTIVE OF THE STUDY: The purpose of this paper is to investigate the hypothesis that Vertical Sleeve Gastrectomy (VSG) can be performed safely as an outpatient procedure and with equivalent results as an inpatient procedure. 2. DESCRIPTION OF METHODS: Patients with obesity were selected to undergo outpatient VSG, evaluating preoperatively their co-morbid medical conditions. Preoperative and intraoperative anti-nausea medication regimen was utilized. Operative times, recovery times, medications, and blood loss data were collected. Postoperatively patients were seen in the ambulatory surgical center the day following surgery and one week thereafter and evaluated for pain, nausea, IV fluid requirements, and any complications. 3. PRELIMINARY RESULTS: Preliminary results are favorable. 4. CONCLUSIONS: Preliminary outpatient VSG can be performed safely in select patients suffering from obesity.